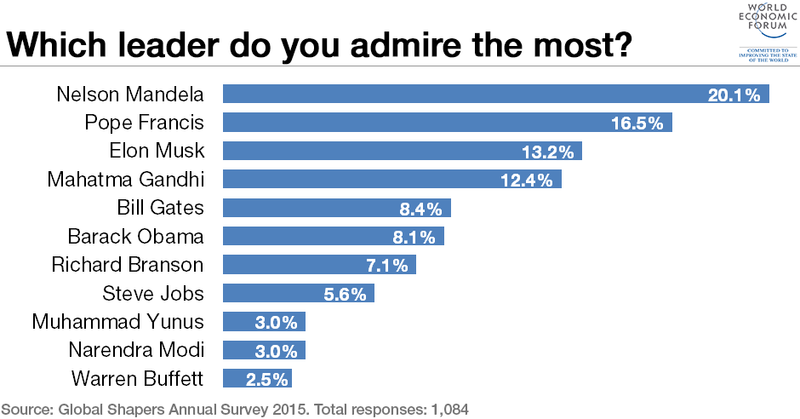 Which leaders do millennials admire the most? Great leaders inspire by setting examples that others want to follow. Many of the top leaders, past and present, are in business or politics, and are making their mark on generations. But which leaders do millennials admire the most? With responses from 125 countries worldwide and 285 cities, the World Economic Forum’s Global Shapers Annual Survey 2015 is one of the most geographically diverse surveys of millennials. The more than 1,000 respondents are all members of the World Economic Forum’s Global Shapers Community, a network of over 450 city-based hubs of young, civically engaged leaders aged between 20 and 30. And these are the top 11 leaders, present and past, that inspire them the most. Nelson Mandela spent 27 years in prison before his release in February,1990. He became South Africa’s first black president in 1994, leading a multiracial democracy until 1999. The abolition of apartheid remains Nelson Mandela’s greatest legacy, and under his leadership, South Africa emerged as a genuine democracy that saw many changes. Not all changes can be attributed to one man, but they were likely more rapid and profound. Pope Francis is the first Latin American and non-European pope in more than 1,200 years. As the head of the Roman Catholic Church, he is the moral and spiritual leader of 1.2 billion people all over the world – from the Philippines, where 86% of the population identify as Roman Catholic, to Brazil, which has over 125 million Catholics. The 44-year-old CEO of Tesla Motors and SpaceX emmigrated to America from South Africa at the age of 17 and made billions after co-founding PayPal. The tech entrepreneur is known for his bold visions – in 2013 he proposed designs for his so called Hyperloop, which would allow people to travel from Los Angeles to San Francisco in 35 minutes. Gandhi is known for his doctrine of nonviolent protests in order to achieve progress. The Indian lawyer, social activist, politician and writer became the leader of the nationalist movement against the British rule of India. The 44th President of the United States is the 6th most inspirational leader among the respondents of the survey. He also tops the ranking as the world leader with the most followers on Twitter. English business man, entrepreneur and founder of Virgin Group, Richard Branson is often listed as an inspirational leader. Virgin Group has over 200 companies in over 30 countries. Steve Jobs was the co-founder and CEO of Apple, and is often referenced as one of the most influential CEO’s of his generation. Mohammad Yunus was awarded the Nobel Peace Prize in 2006 for founding the Grameen Bank and for their work to “create economic and social development from below”. He is a Bangladeshi social entrepreneur and economist. Narendra Modi is the current Prime Minister of India, and has been in office since 2014. American business magnate Warren Buffett is one of the most successful investors in the 20th century. Buffett has invested in strong consumer brands for decades, and is the chairman and CEO of conglomerate holding company Berkshire Hathaway. Which world leaders are top on Twitter?